Don't you just love the name of this group? I follow Hibiscus Stitches blog and have decided to join in the fun. It's kind of like FNSI only this group is all about English Paper Piecing. 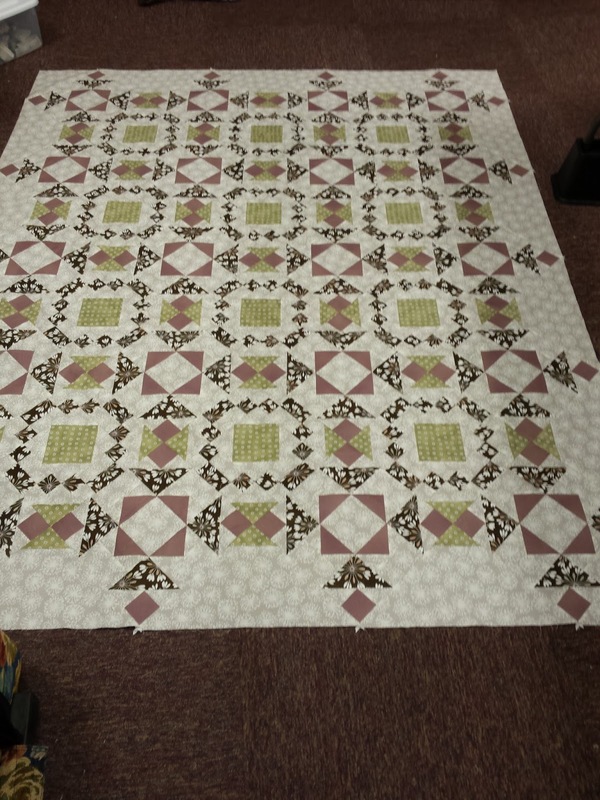 Anyway, I've been working diligently on a border of the Mosaics Quilt by Irene Blanck. 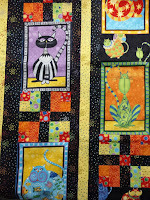 Irene's website is Focus On Quilts and you can see her beautiful quilts HERE. 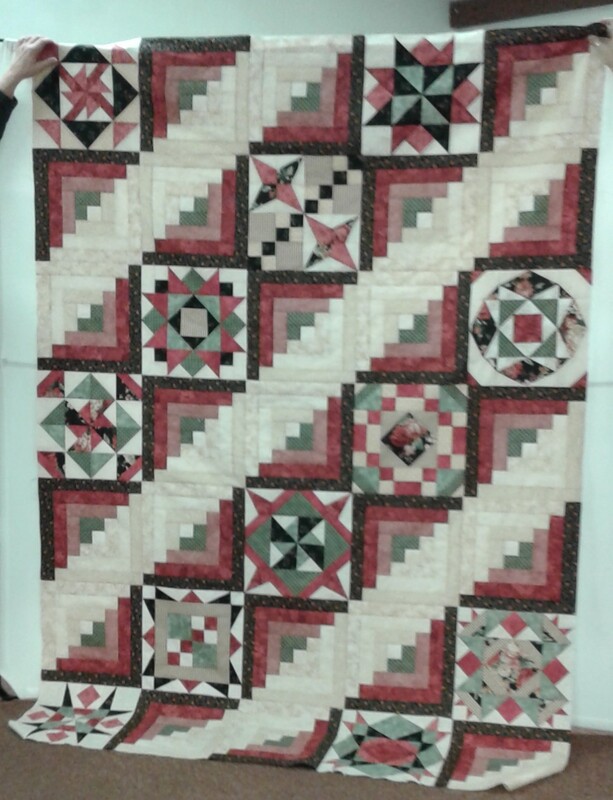 Just click on Quilts and then Gallery. 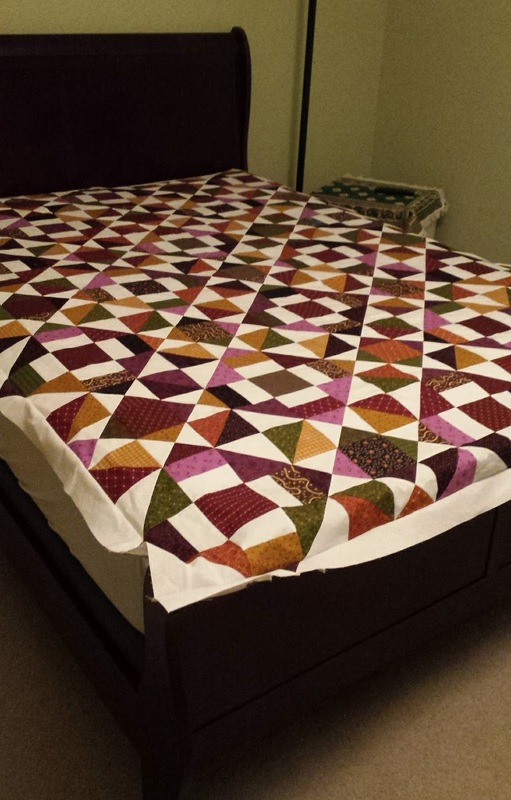 Mosaics is the very first quilt she shows. I've got my center medallion pretty much all appliqued and I'm working on hexi-border #1. Check it out on the left! It was early this morning when I first brought out my project. Polly, my kitty, still needed a bit of shut-eye. How early was it? 3 or 3:30 am. Why? 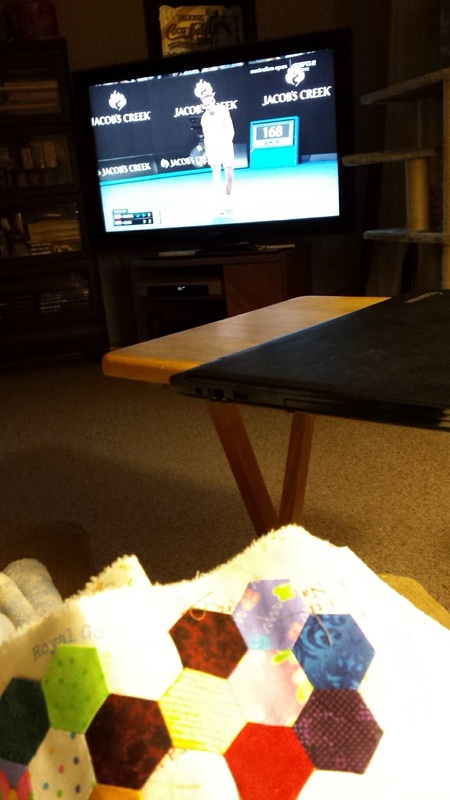 Because the Australian Open Tennis Tournament was being shown live on my TV at that ugly hour and I love watching the major tennis tournaments! The picture on the right shows the view from my hexis. I like Rafa Nadal but he bowed out during the 3rd set due to injury. That's OK. There are still plenty more to watch ... like Carolyn Wozniacki, Roger Federer, Tennys Landgren, and let's not forget Radwanska and Madison Keyes! So much good competition! Well, back to my stitching. 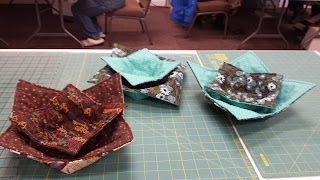 I completed all the way down one side of the ten hexi rosettes yesterday and this morning I was making my way back. 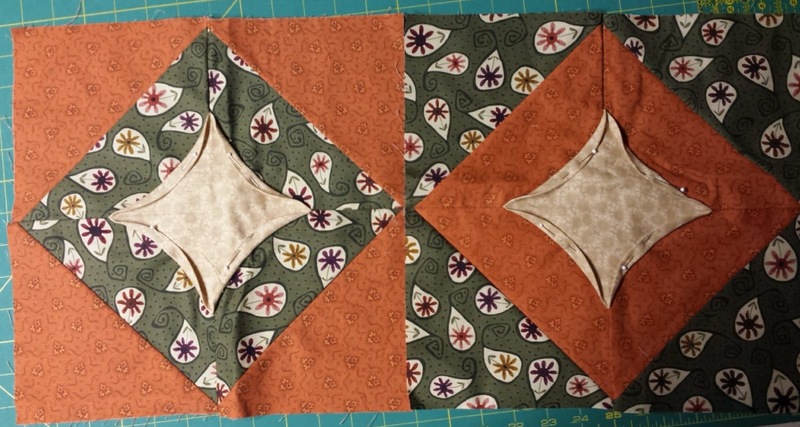 I plan on getting this border finished by tomorrow morning and piecing more hexis together for border #2. I'll be linking up with Hibiscus Stitches. If you'd like more information about Piece Yourself Together events, simply go HERE. If you'd like to see what all the others are sharing, pop in over HERE. Whatever you decide to do, I plan to keep on stitching! Oh! How I missed you! I haven't participated in FNSI since November. December was just too wild with company and the holidays. It's time to enjoy Friday Night Sew-Ins again! Sugarland Designs is so wonderful to keep this monthly happening organized. Thank you, Wendy!!! And this is what I got done. See the bottom right-hand corner in the first picture has no thread nor does the middle bunny. Now it is all done. 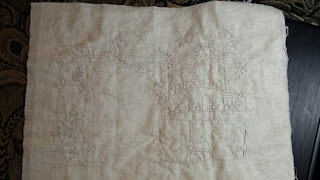 There is some piecing left to do on this project and then the quilting. Check out my project at the top: That's the Winter version. This is the Spring version. It'll be done before you know it! At the very least, it'll be done before Spring! I love Retreat Weekends and I especially look forward to this one. It always fall on Martin Luther King's Birthday weekend and is located about 40 minutes from home. Such perfect timing -- Christmas holiday is over and the house is slowly getting back to normal. Also the closer the retreat, the more time for sewing! I did get a little bit of a later start than normal. I had to stop by my mother's house to check on her bandage. 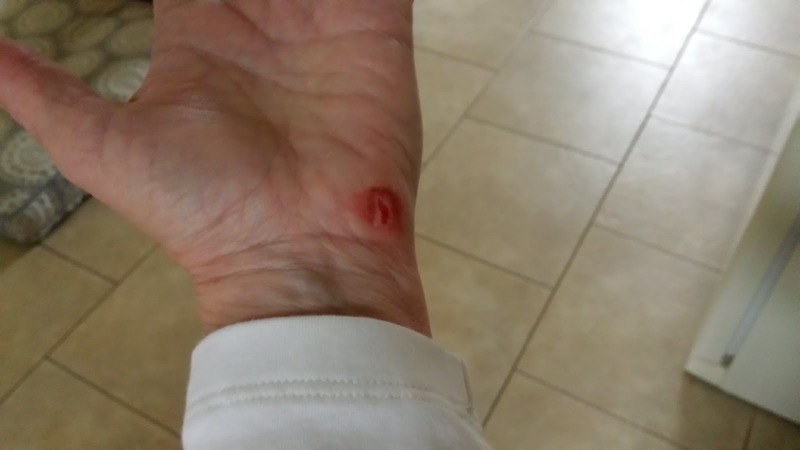 She had a "scrape biopsy" done on her upper right arm. It was hard for her to change out the band-aid since she's right-handed. No problem ... just put me a little behind but it was OK by me. So what did I accomplish? What felt like 100s of flying geese for On Ringo Lake, the mystery quilt presented by Bonnie Hunter. In fact, it was 152 but they are squared-up to perfection and sewn together in pairs. Yes, that's 76 pairs with more needed! 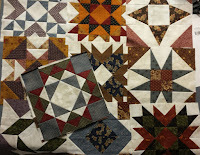 If you want to see this quilt, visit Bonnie's Quiltville blog right here. You can still download the pattern but I'm pretty sure it will be leaving the website soon. Since I'm also starting back on my Farmer's Wife 1930s Sampler Quilt, I took that project with me as well. I finished Block #7 - April. It is a 6" block = tiny! 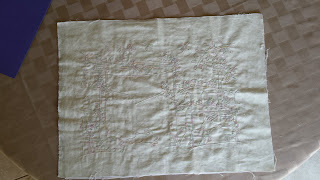 I was working on Block #3 too but then discovered some of it was paper-pieced and I didn't have that part printed out. I'm so grateful that Angie at Gnome Angel started this back up again. She has terrific tips on block assembly, Marti Michell has tutorials for putting together the patchwork blocks, and the book has a CD complete with paper-piecing patterns. This go-round we're piecing the blocks in numerical order, with the goal to complete 2 per week. That puts us done in a year as there are 99 blocks plus assembly. I plan on getting several more blocks in order over the weekend. At least I got one block done at retreat! 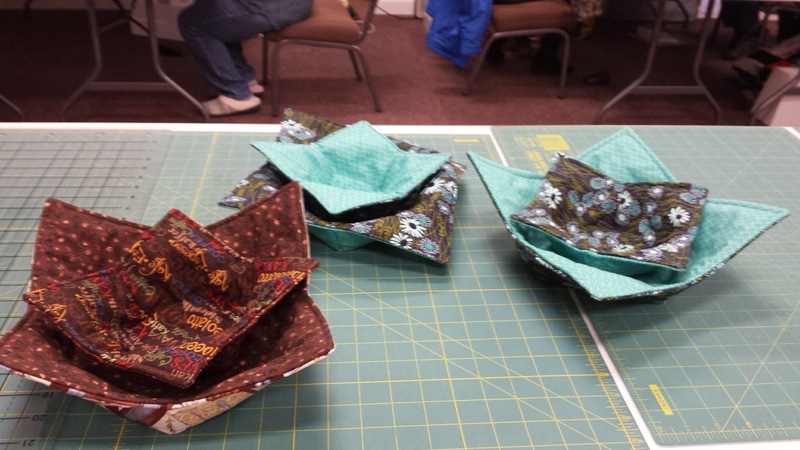 Our retreat's fearless leader, LindaLee, always offers a small project. This retreat was no exception and we put together a matching pair of microwave bowl cozies. They were so cute and easy! I hope to make bunches of them up for the family! So cute! Tonight is FNSI. I've been working on an embroidery project and plan on finishing it up tonight while watching the Australian Open Tennis Tournament. Wendy of Sugarlane Designs is our hostess and it's not too late to join us. If you click here, you'll go to her website and you can sign in. We have fun all over the world from Australia to USA to Europe and possibly more! Sewing is always more fun with friends! I'm off to a good start. My APQ UFO Challenge #12 is done. It was the 10-Minute Blocks Quilt. Since I work at a snail's pace, these blocks took me longer than 10 minutes but I will admit they were pretty darn quick! 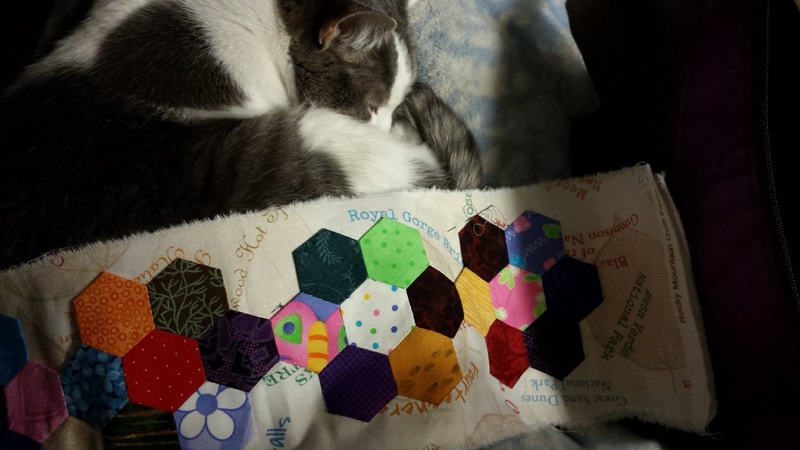 Note: This quilt is Polly-approved! On a side note, I took a tumble at the end of our driveway on the ice the other day. Skinned my palm and knee. Both are tender to the touch but I'm fine. I'm actually getting pretty good at falling as this was my third time since moving here in 2003. Twice was on ice so let that be a lesson to me!!! I'm looking forward to retreat this weekend with my friends. Wonder what I'll take to work on? On Ringo Lake Mystery Quilt has come to an end ... of clues, that is. There will be lots of sewing on it for me over the next several weeks ... months .... hopefully not YEARS!!!! 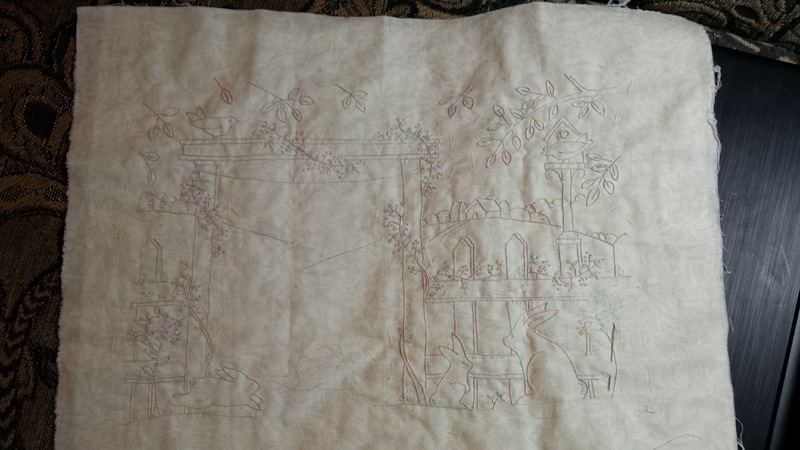 I do have a history of letting time slip by without finishing up projects in a timely manner. New button to provide incentive to keep on quilting. Haha! 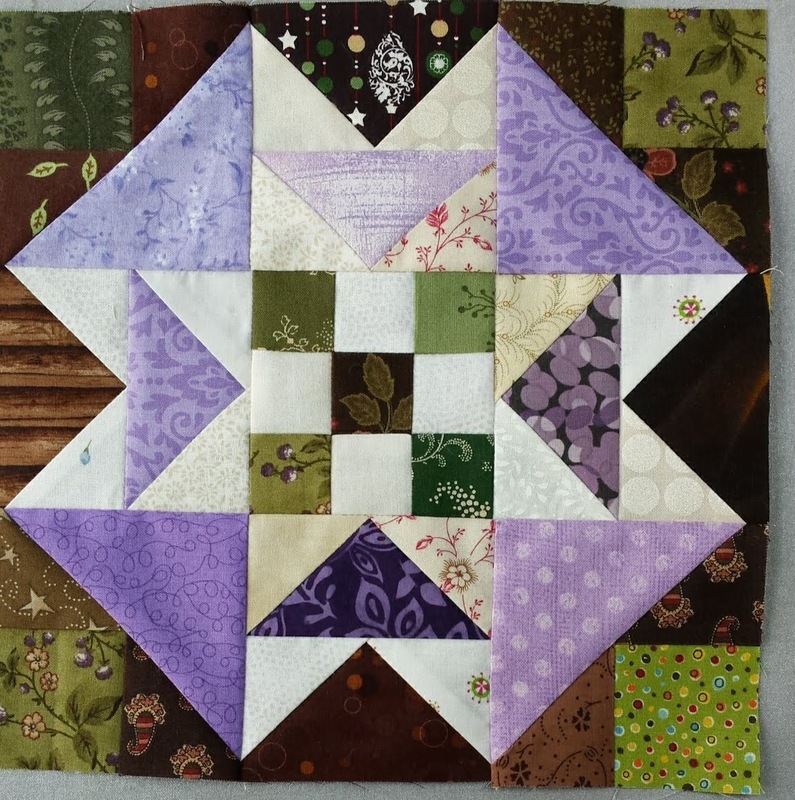 If you want to see how others are coming along on this quilt, check it out right HERE. I took a cue from my friend Dana and put together one block. I'm happy with how it looks and I'll keep on with this. It only gets prettier with the sashing and layout! 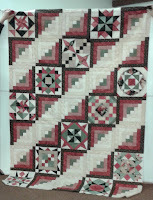 By now you should know I enjoy participating in American Patchwork & Quilting's UFO Challenge each year. Some years I do pretty good. Other times (like 2017) not so much. But January marks a new year and I'll be doing my best to at least make some progress on the following quilts. Before I share my list, I have an important note. As I was trying to decide which projects I really want to work on this year, I was having too hard of a time deciding. Why? Because I didn't want to lose time on my Ongoing Projects (listed in the right sidebar). But I wasn't sure they were "worthy" of a whole month's attention. I was just having such a hard time. So I decided that I'd throw in a couple of Float Months on my list. When those numbers come up, I'll work on whatever my heart desires that month ... could be finishing up an earlier project worked on during the year; could be extra time to spend on one of the Ongoing Projects; could actually be a brand new project that I just HAVE to work on!!! Who knows? Who cares? Two FREE MONTHS sound good to me and seems a bit more doable for my style of quilting. 1. Jamestown Sampler. This was a BOM at Sweet Annies Quilt Shoppe. Sadly the store is no more. This project has been worked on in years past and I aim to finish the top at least this year. I have three mitered borders to add to get this top completed. 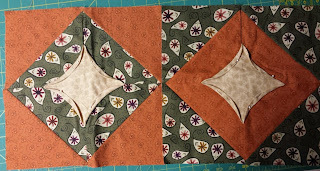 I hate borders and mitering scares the bejeebers out of me! 3. Blowin' In the Wind. 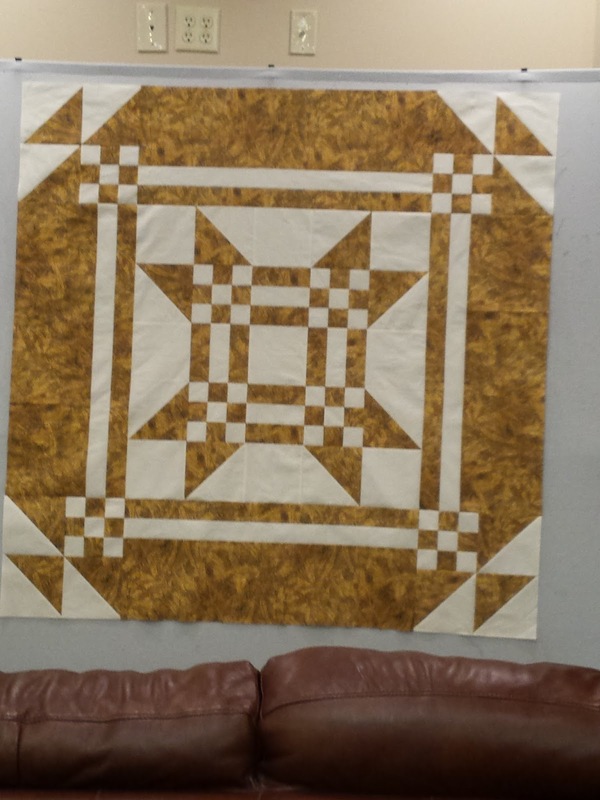 A mystery quilt from Rosemary's Quilt Shop. Last touched -- January 2015 at retreat. This one has made the list several times and yet here it is again -- not finished! Another top that is finished except for the borders. Time permitting, I'd like to have it quilted this time around too! What a dreamer! 4. EPP Sheep Doorstop. 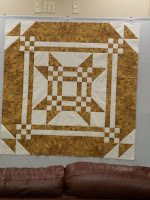 I started this project quite some time ago from a Primitive Quilts & Projects magazine. I thought I was being clever and wouldn't need to make as many hexis as called for. I was ready to start cutting up the fabric until .... yup, should have followed the directions to a tee. This one shouldn't take too long but part of the time will be to figure out where I left off. 6. March 2015 Gold Star. Another MQAL that I did through Rosemary's Fabric Shop. Do you get the idea that I might like mystery quilt-a-longs? Anyway it only needs quilting. I would love to have this one hanging over my couch or in the kitchen. I totally love the two fabrics I used and am anxious to see what's left that I can put back into the stash! Isn't that the most ridiculous reason you ever heard to finish a quilt??? 7. Kitties For Sarah. The panel & coordinating fabrics came from Rosemary's Fabric Shop. 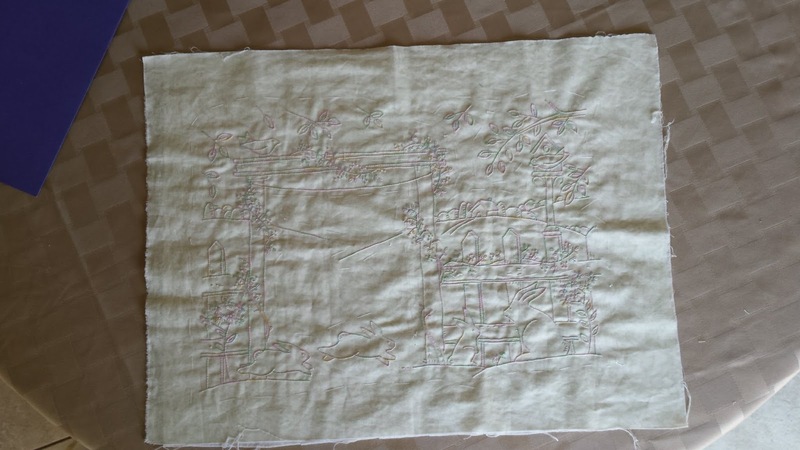 It's ready for quilting which should not be too difficult. 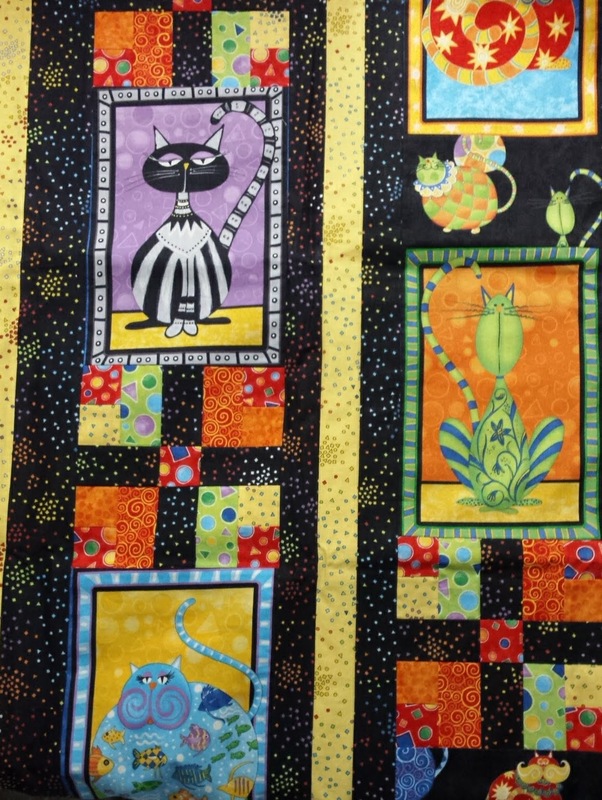 Outline the kitties and put something simple in the 9-patches, sashing, and borders. I've got the backing stashed with it, might need some batting. 8. Colorado Shop Hopping with Linda & Corky. I LOVE THIS PROJECT! As the name implies, the blocks and fabrics were collected on a Colorado Shop Hop and my sister Linda, her friend Corky, and I were going to tackle it together. Because each shop had its own layout design, each of our quilts were going to be slightly different. 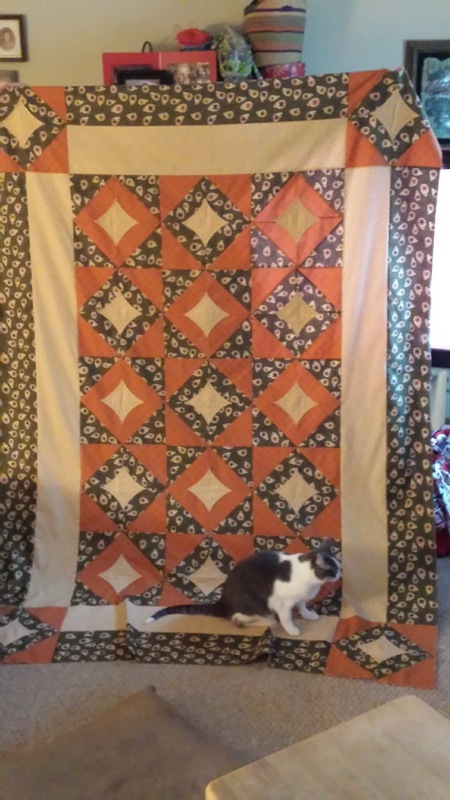 Corky purchased an entire kit and her quilt has been finished for quite some time. Linda may still be working on some of her blocks. 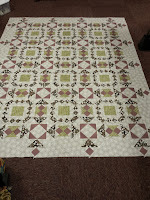 I decided to combine two shop layouts, do a pieced sashing, and to also add a pieced border. 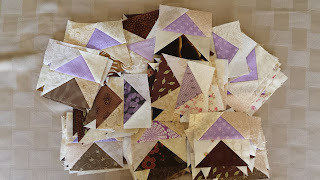 My blocks are done and quite a bit of the pieced sashing is done. I hope I wrote down my ideas because it has been FOREVER since I've even looked at this project! 10. Scrap Dance Two-Step. Another MQAL but this one was through From My Carolina Home blog. I did it entirely with scraps and chose the queen size for my guest bedroom. 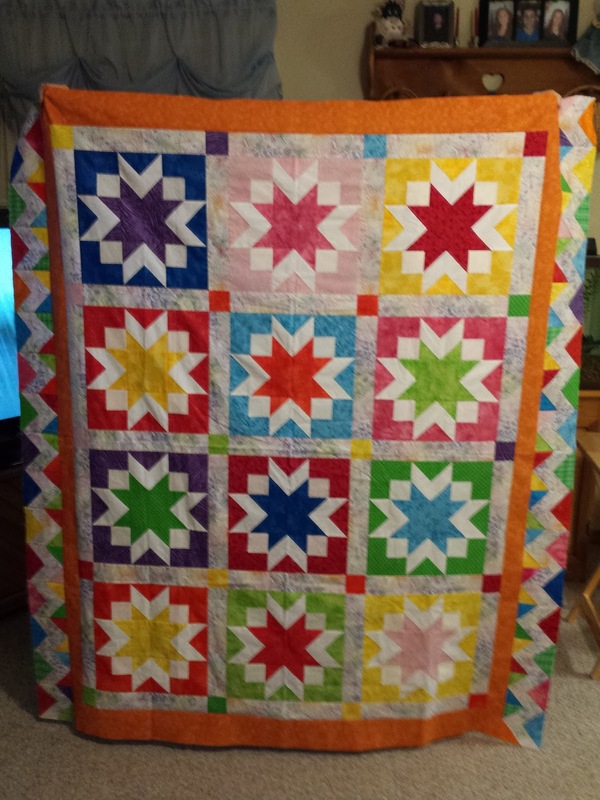 However, my daughter-in-law asked for a quilt and it may be sent to her and my son. 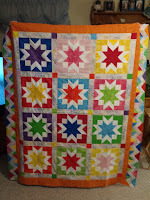 Then again, I still may keep it because I've got another quilt in my mind that is more their style and colors. Wherever this one ends up, I plan on adding two borders to the sides to widen the entire thing and add a final border all around. Should make a perfect queen-sized quilt! 11. Layers of Love. Made out of a fabric swap with my retreat friends. 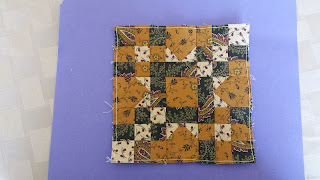 The pattern & technique was taught by Lynn Hagemeier from Kansas Troubles Quilts by Moda. I love how this is turning out. I need to finish the top & bottom borders with a pieced cornerstone. Of course there is one last border also -- my nemesis! 12. Ten-Minute Blocks Quilt. Started in a class by LindaLee from my guild in December. There were only three of us that showed up for the class. We are to have our toppers done to show the guild what they missed at the next guild meeting (January 9). I'm putting this as my #12 because I know that this is the first number chosen for the 2018 UFO Challenge and I have a deadline. It should also give me extra time to get the first block of On Ringo Lake done and continue making progress on it. Yes, I'm already patting myself on the back for a probably successful 1st month of the challenge! So there you have it: a few of my quilting goals for this year. Keep on sewing!